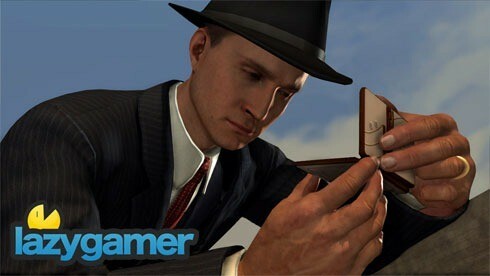 Rockstar and Team Bondi’s soon to be released LA Noire has had a long, complicated history. Originally planned as a PS3 exclusive – and funded by Sony – it’s evolved in to becoming a multi-platform adventure, bound for the Xbox 360 as well. 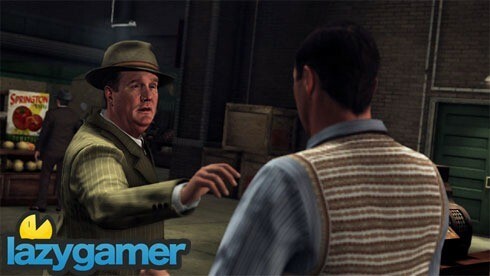 L.A Noire, as its misspelt title suggests is influenced by the noir film genre, and offers up a rich, detailed look at the glitzy, glamorous Los Angeles of the late 1940’s. 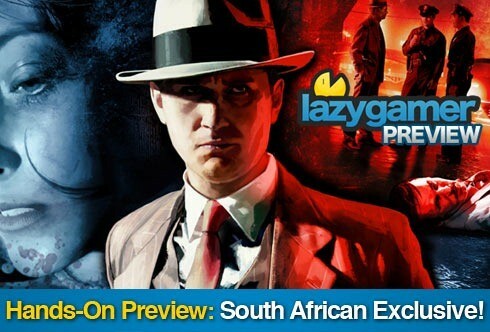 In it, you’ll rise through the LAPD ranks as Cole Phelps (superbly characterised by Mad Men’s Aaron Staton), a decorated veteran-turned detective exposing the gloomy, dark side of an otherwise vibrant and optimistic post-war America. Unlike with Grand Theft Auto, there’s no moral grey area – Phelps is an above-board, by-the-book fella, whose main focus is on justice; something that can’t be said for the corrupt officials that surround him. After years of near media silence, the game is nearly upon us. When I was given the opportunity to give the game a hands-on, I jumped (on a plane) at the chance. My introduction to the game proper – demoed by one of Rockstar’s PR guys – came as quite a shock. â€œThe Red Lipstickâ€ murder, one of the cases you’ll play through in your ascension through the ranks of detective, kicks off with an uncompromisingly brutal scene of a young woman being dragged from her car in the dark and bloodily beaten to death with a blunt object by an unknown, shadowy figure. It’s the first case in Homicide, the bloodiest of the five desks you’ll work. Next, we’re shown the briefing room, where Phelps and his chubby homicide desk partner Rusty Galloway are apprised on the discovered murder by Captain Donnelly, who sends them to meet the coroner at the scene of the grisly crime. He drove to the scene in an unmarked police vehicle, demonstrating the incredibly realised, mostly accurate recreation of a periodic Los Angeles. The open-world is frankly staggering in its vibrant authenticity, and the largest map of any Rockstar game to date. If you’re not a fan of sandboxes though, don’t be put off or intimidated; it’s a linear game, with an episodic style of progression. The huge, living world is just there to make it feel more real. Arriving at the scene, we find that the victim’s horribly mutilated and starkly naked body has had cryptic markings and phrases scrawled across it – matching the modus operandi of the infamous Black Dahlia case that rocked Los Angeles. I’m shown briefly how the investigation aspects of the game work. When walking around the crime scene a short, jarring two-toned piano refrain signals a discovered clue, which can be investigated further with a single button press. The item or clue, now from a zoomed-in perspective can be manipulated in Cole’s hands with the left-stick, with important information being relayed to Cole’s important journal. The dead bodies can be examined in four areas; the head, torso, and each of the arms. There’s no investigation below the belt, because it’s decidedly pervy, and would probably have instantly given the game a damning Adults Only rating. I then had the opportunity to play the game myself. The case I was allowed to play was â€œThe Silk Stocking.â€ Donnelly briefs Phelps and Galloway in an authentic 40’s diner, sending the pair to meet with the coroner for investigation. Much to my dismay, I had to drive to the scene. Regular readers would know that vehicular-based gaming is my Achilles heel, and that I’m terribly likely to introduce cars to walls, lamp-posts, and people’s faces. Oddly, I actually found the driving to be pretty fun and relatively easy to do; cars seemed to handle well and weren’t as unnecessarily weighty as the ones from GTA. The analogue stick’s deadzone was too absolute, making steering a little jolting, but I’ve been told that’s been since fixed in later builds of the game. Something I did find refreshing, and aiding the authenticity is that although there’s a mini-map, there are no GPS directions or waypoints when driving. Instead, a button press prompts your partner to give you directions, like â€œTake the next right,â€ or â€œturn left here.â€ You can also, much to my relief, enlist your partner to do all the driving for you. You can, as in GTA drive about as recklessly as you wish, and commandeer civilian vehicles at your leisure – but that sort of freedom may come at a penalty.